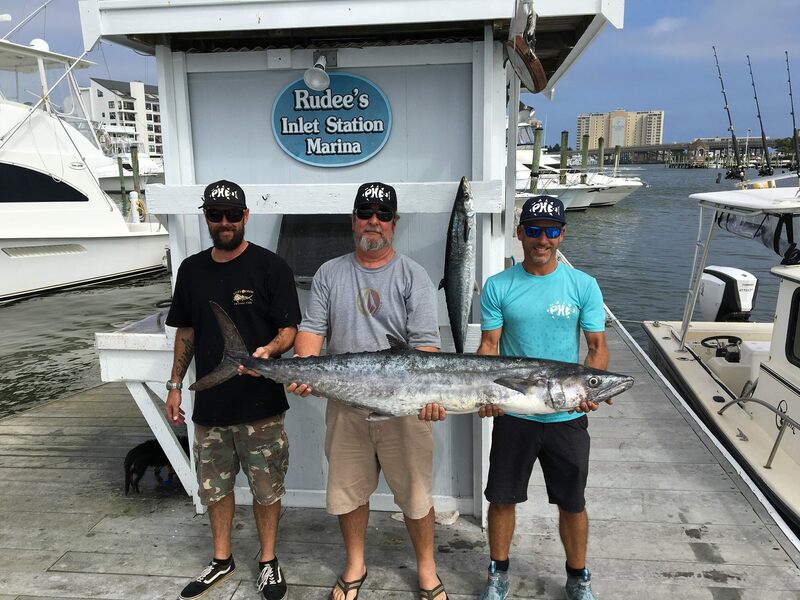 Virginia Beach, VA – The king mackerel bite gets top billing this week! Virginia anglers are landing them in the 40 to 50 pound class … Pretty work! The offshore bite has been excellent. Anglers are landing some wahoo and releasing a good number of white marlin and a few blue marlin. There are still plenty of mahi around. Captain Dave on High Hopes Charters found plenty for his crew on this trip. This is great late season action! Our ocean wrecks are producing seabass, triggerfish and a few flounder. Craig Irwin and crew had a fine day on the wrecks. Large red and black drum are beginning to leave their summer hangouts in the bay. Reds are still being landed on the shoals, but numbers are now increasing along the oceanfront in the surf. 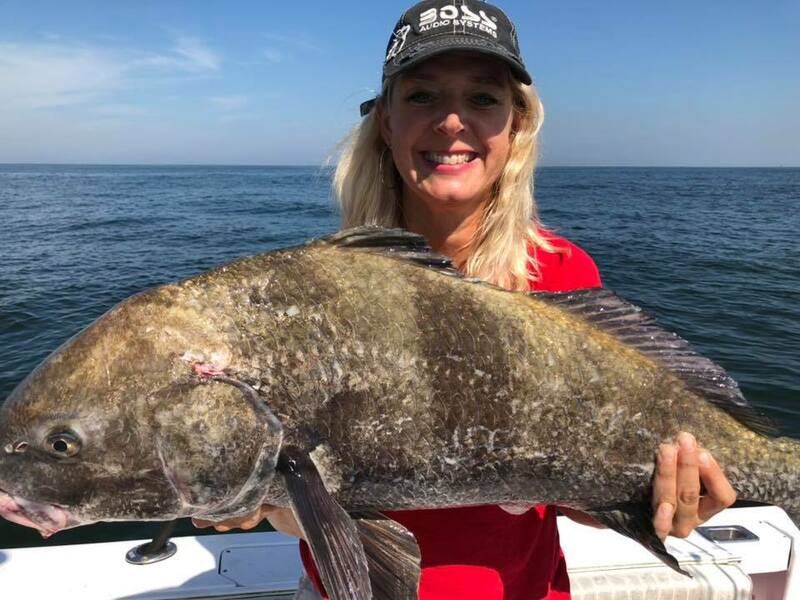 Beth Synowiec landed this nice black drum in the bay near Cape Henry. Cobia are on the move as well. For a few days there were cobia on just about every buoy in the lower bay but numbers are decreasing. Remember cobia season is closed; all fish have to be released. The Bay striper season opened October 4th. Anglers are now allowed to keep 2 rockfish between 20-28 inches per day. However, one fish may be over 28 inches in a 2 fish limit. Small stripers have been reported around the CBBT islands and kayakers have been catching them around the rocks at Rudee Inlet. There are some large bluefish mixed in at both locations. 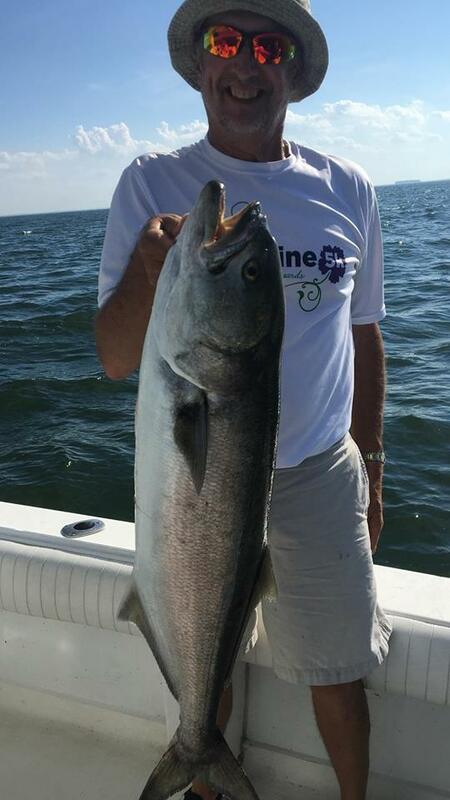 Captain Craig Paige on Paige 2 Charters got into some large bluefish at the islands, he released this nice 37-inch citation fish. The bridge tunnel is still home to some nice sheepshead. 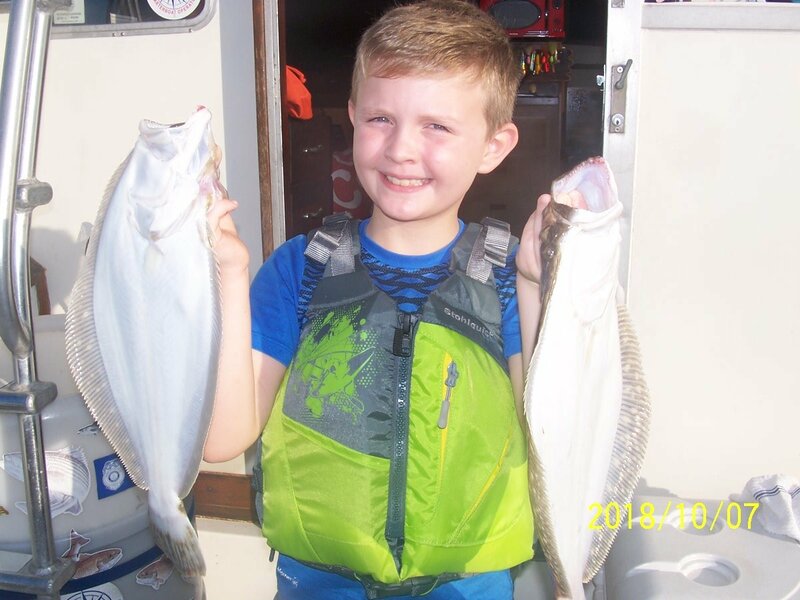 Henry and Luke Bolin did some father, son fishing inside Lynnhaven Inlet Saturday and caught a dozen nice spot, a dozen croaker, two speckled trout and a few black drum and puffers. Captain Bill on Key Dreams Charters enjoyed a nice day on the bay doing some family fishing. 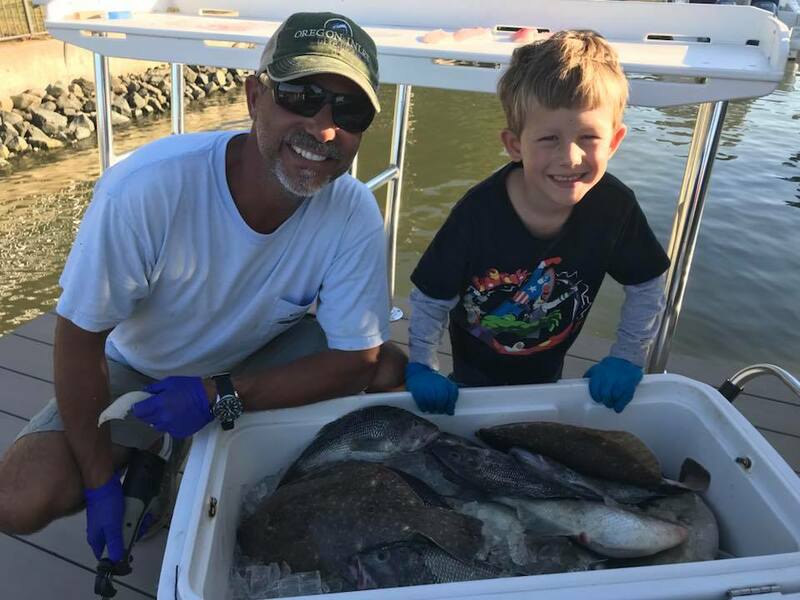 They caught 6 flounder up to 20 inches, spanish mackerel, sharks, puffers, and seabass. The bluefish bite is good in the surf south of Oregon Inlet. There are some scattered mullet and pompano also available. Large drum are starting to show in the surf. Soundside anglers on the Little Bridge on the Nags Head/Manteo causeway reported trout, bluefish and some keeper stripers. OBX Pier Fishing Report: Avalon: trout and drum. Nags Head: bluefish, spades, black drum, spanish and trout. 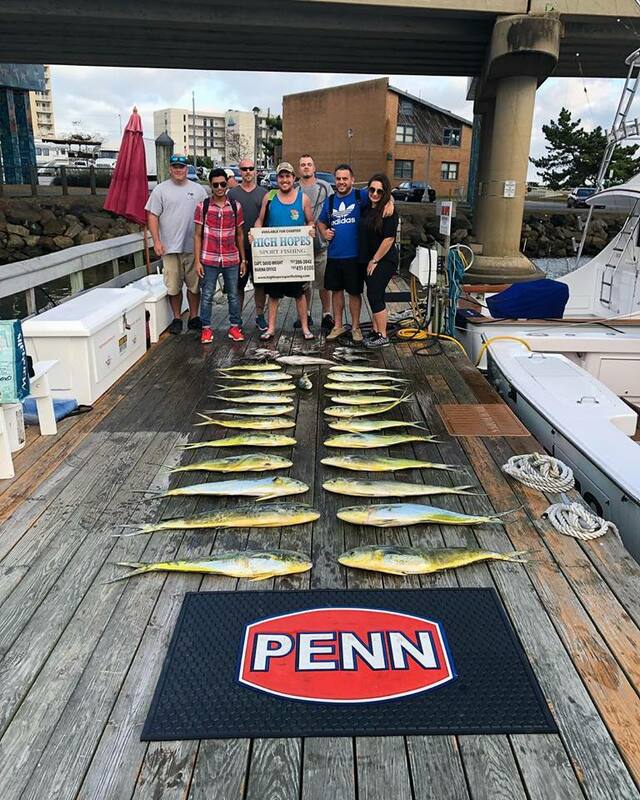 Jennette’s: pompano, black drum, trout and bluefish. Outer Banks: spanish and blues off the end, pompano, sea mullet and trout. Red Drum are being caught at Avon. Other species being caught there are bluefish, sea mullet, puppy drum, and pompano.